You are encouraged to "come as you are." We explore life in the light of God's love through Scripture, message, music, prayer, and praise. Dress up or dress casual. Sing boisterously or listen to the music and soak it in quietly. You are welcome just as you are at Advent Lutheran Church. Both worship service times will offer Holy Communion to all in attendance. As a faith family, we gather to offer our songs of praise as well as our lamentations to the God who created us. We join together to hear God’s word in a holy space and meet at the Lord’s table to receive the grace that Jesus promised to each of His children. It is important that everyone finds a welcoming and comfortable space that allows them to be open to God’s presence each week. Advent offers two different worship styles, one blended-traditional in format and music at 8:30 and one contemporary in format and music at 11:00. Both services include Holy Communion and take place in our sanctuary on Sunday mornings. Lenten services each Wednesday include dinner and fellowship and drama. This year’s Lenten services begin March 6th with Ash Wednesday. Click to see the full schedule for Lent and Easter. Advent has a robust musical program that gives the congregation many different ways to either offer their own talents or enjoy the talents of their neighbors. We are definitely a community that loves music in many different forms. 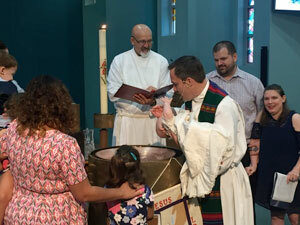 As the name suggests, our traditional service at 8:30 am offers a more blended-traditional music selection with a mixture of hymns and worship music familiar to many who have grown up in the Lutheran church. In addition to chancel choir, we have a women’s choir, a men's ensemble, and two bell choirs which are regularly part of worship. 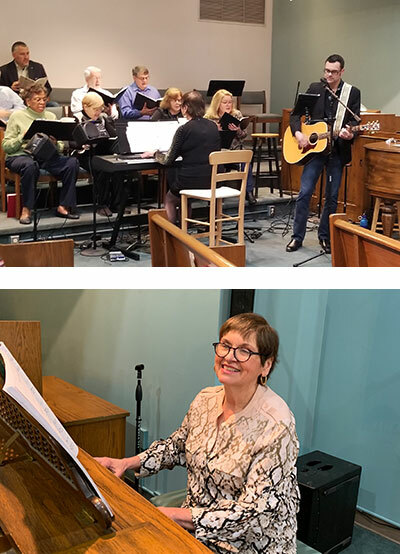 Alternating piano, sequencer and organ accompaniment in morning worship, this service also features special event dramas and musical programming throughout the church year. At 11:00, our music is contemporary in style and is anchored by guitar, keyboard and our Grace Alive ensemble. This service does not use a hymnal and often features music from modern Christian artists and composers. Our worship leader in this service, Mars Licciardi, also offers a Music with Mars program for our children and youth on Friday evenings. Music with Mars is open to all levels of musical ability and includes learning to sing and play various instruments. Come join one of our musical groups and make a joyful noise! Audition is needed to join this group. Rehearsals are 2 Wednesdays a month after Chancel Choir. NEW! Audition is needed to join this group. Rehearsals are immediately following the 8:30 service on Sundays. The vocal group for the contemporary service rehearses at 7:15 on Wednesday nights. Open to all and rehearses 6:20-6:50 on Wednesdays. Experienced ringers meet on alternate Thursday evenings from 7:00-7:45. I'm INterested in Grace Alive!